Is Sydney crazy, or is it kind of weird that her dad-a guy whose entire job revolved around other peoples' secrets-crashed alone, with no explanation? As the two girls grow closer in the wake of the accident, it's clear that not everyone is happy about their new friendship. THE TRUTH ABOUT KEEPING SECRETS is a page-turning, voice led, high school thriller. From Goodreads. I received this eProof for free from Penguin via NetGalley for the purposes of providing an honest review. Trigger Warning: This book features discussion and description of multiple deaths, discussion of elements of the embalming process, discussion of an abusive relationship: controlling and manipulative behaviour, stalking, abduction, attempted murder, discussion of racism, and homophobia. 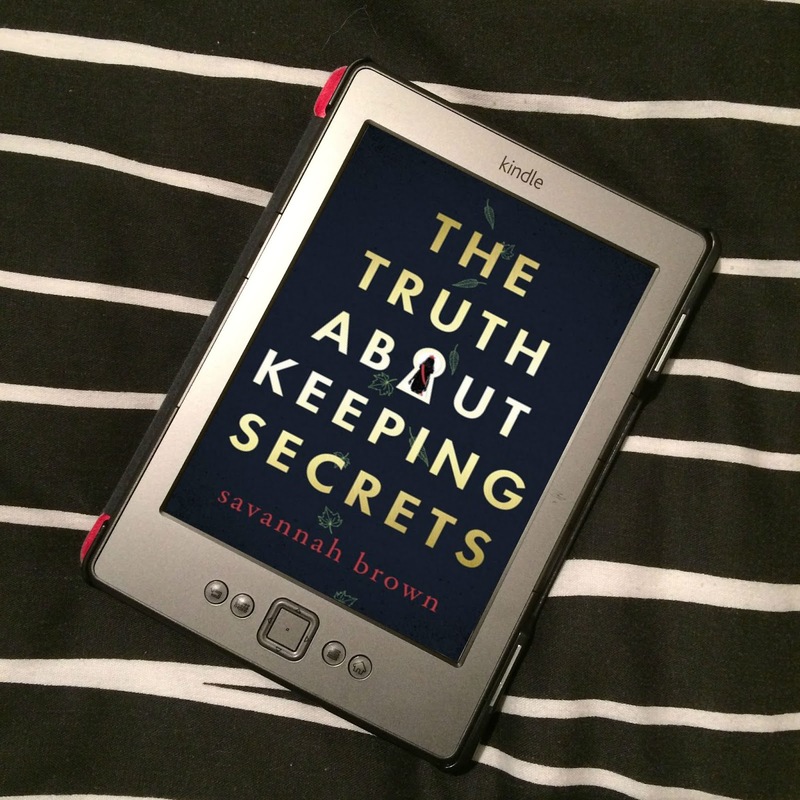 I quite enjoy a YA thriller, so when I heard of The Truth About Keeping Secrets by Savannah Brown, I was really excited to read it! It wasn't quite the story I was expecting, but I really enjoyed it! Sydney's psychiatrist father died in a car crash, and she's struggling to come to terms with it, and deal with her grief. The police investigation have written his death off as an accident, but that doesn't sit right with Sydney. She is convinced there's more to it. People don't just drive their cars into telephone poles for no reason. And, being a psychiatrist, he's going to know people's darkest secrets. Sydney knows he must have known something someone would have preferred he didn't, and killed him. When June, the post popular girl in school, turns up in the middle of her father's funeral, and is found days later at his grave, Sydney can't stop wondering why. The two form a friendship, and it's not long before Sydney falls for her. When someone starts sending Sydney threatening, homophobic text messages, Sydney is sure that whoever it is killed her Dad, but no-one will believe her. I really, really enjoyed this story, even though it's not quite as thriller-y as I expected; for a lot of the book, it felt a lot more like a contemporary, with something strange happening one day, and something strange happening weeks later. Until the last 40%, the focus is mainly on the relationship between Sydney and June. I really liked them! As people, I couldn't help but warm to them. But neither of them are ok.
Sydney is struggling with her father's death, and as she's convinced someone killed him, she can't move on. As well as struggling under the heavy weight that is grief, she's also developed an overwhelming fear of death. She can't stop thinking about it; her dad's death, and how she might die, could die, at any moment, and sometimes wishes she was dead, just so she could stop thinking about it, stop being so scared. When online, she accidentally comes across Time of Death, a website that illegally shows camera footage of various real life deaths, be it from a mobile or CCTV. She becomes obsessed with it, spending hours watching video after video, an unhealthy coping mechanism; if she knows death, maybe she won't be so scared. The only thing that helps is June. Being with June, thinking about June. A friendship between the two forms after a conversation at her father's grave, and another when June turns up outside Sydney's dad's home office in the middle of the night. From then on, June is taking Sydney to and from school every day, and these are the only moments Sydney feels any kind of reprieve. June is beautiful and warm, and she cares, and Sydney holds on to her like a life raft. She forms an unhealthy attachment to June that eclipses everything else in her life - including her best friend, Olivia - as thinking of June and being with her are the only things that will keep her fear and grief at bay. My heart broke for her so many times, and I was always worrying about her. June was just awesome. We find out very little about her because she doesn't really talk about herself much (we find out why later in the book), but she is genuinely kind and warm, and just such a nice girl. I really, really liked her. Which was surprising to me, as she doesn't fit that trope of popular girls being mean girls. She isn't, at all. She's just lovely. She obviously has self-esteem issues, and issues around how she sees herself, and she kind of keeps Sydney at a distance as there are some things she just won't talk about, but at the same time, she truthfully cares about Sydney, and tries to help her with her grief in various ways. Sometimes she doesn't do the right thing - she makes mistakes, she's only human - but she has her heart in the right place. I know this kind of makes her sound insipid, but I can only say so much without spoiling the story! Although I was expecting more from the thriller aspect of the story, I actually really liked that it was a slow burn thriller. Sydney is already convinced that someone killed her dad, so when she starts getting threatening, homophobic text messages from some unknown number, she's sure this person, whoever they are, is the killer. But they will go weeks without sending anything, and things go back to Sydney's current version of normal. But it goes from text messages to more stalkery behaviour that is actually quite sinister - and even more so because of the time that elapses in between each "event"; not only do you not know what they're going to do next, you don't know the when either. Sydney kind of thinks they've got bored and left her alone, and then something worse will happen. It really picks up in the last 40% of the story, and becomes quite the nerve wrecker. And I never worked out who it was. I was pretty much suspecting everyone Sydney knew, and even though I did suspect the actual stalker at some points, I will still completely surprised! What I found really upsetting, though, was how people responded to it. Olivia pretty much brushes the texts off. When the police are told, they brush it off as bullying. They're going to talk to the school, but that's it. This isn't bullying, I need to make that clear. This is stalking. But even if it was bullying, the attitude towards it is disgusting. Bullying is serious, and not something to just brush off and dismiss. People have died by suicide because of bullying. But once the police officer hears of the homophobic bullying Sydney experienced in the past, his whole attitude towards the crime changes, and gives off this, "this isn't that serious" vibe. This isn't a criticism of the writing or the story, because I think it's probably realistic. It's a criticism of people in power not taking bullying seriously. If I was to give a slight criticism, it would be that the dialogue was a little too realistic. There was a lot of "ums" and "likes," "I guesses" and "I means," things like "yeah, no" - an agreement that something is a negative. And while, yes, that is realistic, it kind of slowed the dialogue down a little, and it didn't flow so well. However, otherwise, Brown writes so beautifully, I'd just become completely captivated by the words, the flow of the sentences. She paints such pictures, that Sydney's surroundings feel alive, like characters themselves - a river, snowfall, a cemetery. It's just gorgeous, and you really feel like you're there, seeing it all. And Brown is also able to put thoughts and feelings into words that I struggle with, and not only that, but so beautifully, too! I really cannot get enough of her writing! I'm pretty much persuaded to buy Graffiti, her book of poetry, because if Brown can do this in prose, her poetry is going to be magical. I absolutely loved The Truth About Keeping Secrets. It was such a beautiful, difficult, captivating story, and the writing is to die for! A wonderful debut novel, and I'll be keeping an eye out for whatever Brown writes in future!